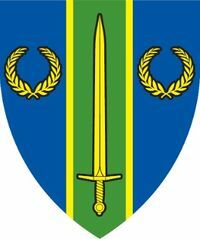 Azure on a pale vert fimbriated between two laurel wreaths a sword Or. This is the Wiki page for the Shire of Caer Adamant, which borders are that of the State of Delaware, within the East Kingdom of the Society for Creative Anachronism. We have many activities within the Shire Please contact our chatelaine at chatelaine@caer-adamant.eastkingdom.org for more information or to get involved. Blazon: Azure on a pale vert fimbriated between two laurel wreaths a sword Or. The green is for the state of Delaware, surrounded by golden shores and the waters of the Chesapeake Bay and the Atlantic. Name and device registered November 1991. Populace badge: Azure, a pale vert fimbriated Or. This is a badge for the populace of the Shire of Caer Adamant to wear or to mark their belongings, being the Shire's registered Device without the charges. This page was last edited on 24 April 2019, at 11:31.